To my chagrin, I haven't been contributing to Low End Mac the last few weeks. Instead, I found myself working through a few hardware and software difficulties. Although not generally major, they did need to be addressed. In the midst of handling those issues, I took the time to rearrange the pecking order for my computer systems. What I found may seem shocking for the guy who spends time testing 680x0 Mac systems for their ability to play back compressed digital music, yet here I am, falling back to Mac OS X on my primary computer system. At least for the time being, I am content to use OS X as my main system. I'm fickle, so who knows where I'll be with my computers in a few weeks time. I'm sure some people are wondering what prompted this change of heart. To be clear, I am not abandoning the classic Mac OS or classic Macs. Besides the fact that my current Mac of choice is a six-year-old 500 MHz iMac DV SE from the summer 2000 series, I still have my legacy Mac fleet operational - mostly anyway. I'll deal with my Macintosh systems report card in a bit, but first I'll clarify my absence over the last few weeks. Three issues led me to this transition back into the OS X fold. Let us take a moment to recall my Power Mac 7600 CD-ROM issue during the digital jukebox project. This issue precipitated the initial transference of workflow to the B&W G3. Over the next few months, I spent more and more time migrating my entire workflow over from the Power Mac 7600 and PowerBook 520c to the B&W G3. Everything ran smoothly, and this system was certainly more powerful than any of my other Macs. Unfortunately, a boot partition corruption caused a small fit to get everything back running smoothly. A more detailed, but far from exhaustive, account can be found on the AppleSwitcher Blog. Everyone please take note of issue one. Issue two, while not effecting my own computers, actually preceded the B&W G3 issue. My old iMac, the very same model I'm back to using now, was until recently under my mother's care. She needed a computer about a year ago, and I had a bunch of old systems to use. Consequently, my mother got the best one for her modest computer needs. In a way, I am struck by the oddity. I, the computer enthusiast, am happily futzing about with a cadre of ancient computers. My mother, the computer user by need, not desire, is using the most recent system in our family collection. I suppose the safe choice for her would be OS X on a fully supported model. It turns out I made the right choice. While a computer savvy person is more likely to possess the skills needed to wring the most out of a given system, a less demanding user just wants something that works. They clearly do not need the newest, most powerful system available, but a middle ground is required. In my mother's case, a nearly six-year-old G3 iMac happened to be the most powerful computer available, but it's clearly far from cutting edge. My mother was happy enough to use the iMac for browsing the Web, sending email, typing the occasional message, or other odd task until the modem came down with a case of the disconnects. This was a rather severe inconvenience for someone so reliant on Web access, and it put a crimp in my normal schedule as I donned my family IT cap. The fix for my mother was to shop around for a newer computer, and I was tapped to find a replacement. Donning my system acquisitions cap, I gleefully hit the Web and local stores looking for a replacement. I suggested several Mac models, both PowerPC and Intel, and even other x86 branded computers running Ubuntu Linux. Content with the Macintosh platform, I was excited to uncover a refreshed 12" 1.33 GHz iBook G4 at the local Apple retail store. The $629.95 out the door price solidified the choice for this upgrade to "obsolescence". My mom doesn't mind using older technology - after all, she got along fine with the G3 iMac until the modem became flaky. I can honestly say this Apple portable, even powered by the venerable G4 processor, is the nicest Mac I've spent extensive time using. It runs cool, is very quiet (until the noisy optical drive is engaged), and it's compact. My mother seems to love the little 'Book. I'm happy to have been granted the chance to test and configure the iBook before handing it over to my mother. I suppose, my mother's upgrade to the iBook G4 can be put on the record as issue number three. Suddenly my iMac was free to be redeployed to my particular computing requirements. My good friend was coming back to me! I, a clear benefactor of my mother's upgrade, remain happily computing with the G3 iMac. Before the internal modem became troublesome, I had upgraded the iMac with 1 GB RAM and Panther for my mother. With the help of a Keyspan Twin Serial Adapter I'm back in business with dialup via my superb external Global Village v.92 serial modem. A kind swapper from the LEM swap list sold me the Keyspan adapter for $10. I though the price fitting for salvaging my first "post Steve Job's second coming" era Macintosh. Before the summer 2000 iMac DV SE was purchased late summer of that very same year, I spent my time tooling around with the original Power Mac, the small footprint 6100. Quite clearly I have a soft spot for both this iMac and the first Mac I ever owned, my still functional LC II. I can see myself keeping both functional for several years to come. Alas, the Power Mac 6100 went to the great recycler in the sky, because it ceased functioning (actually, I found out a few year later all I needed was a $5-10 battery to get the computer functioning again, but it's too late now). Whither the Classic Mac OS? I am not abandoning the classic Mac OS, but my primary computer is no longer running it. Mac OS X 10.3.9 (Panther) is robust, and a 500 MHz G3 with 1 GB RAM is more than capable of coping with the demands for increased resources placed by Mac OS X. The G3 iMac DV SE is a great Mac for my bedroom desk - quiet, cool running, compact, and still viable to run a robust, multitasking, memory protected operating system like OS X. The difference in stability means I can spend time working or testing on any of my classic Mac OS machines, but if I need to browse the Web, the cooperative multitasking OS no longer hogs the machine while trying to work through a particularly knotty page. I can easily continue encoding music, watching television, downloading email, testing some feature on the classic systems while the iMac handles Web-related tasks without breaking a sweat. If a classic Mac OS system ceases to operate effectively, the iMac can take on more and more tasks without losing productivity. Time to break out my Mac system report card and give an overview to what role my classic Macs playing in my computing life. The B&W G3 comfortably ran Mac OS 9.2.2 and was able to accomplish nearly everything I threw its way. However, it was sort of noisy as a bedroom machine and took up a decent amount of space. Instead of keeping it around for server duty or some other task, I stripped it back down to the original - almost bare bones - state from when I acquired the Power Mac. The 350 MHz processor, revision 2 motherboard, DVD-ROM drive, and Zip drive all remained. My local craigslist brought me $10, and the unit went to a first-time Mac user who liked the prospect of scavenging parts to complete the project. Coming from the Windows computer realm, he was used to building his own box. I happily emailed this fine gentleman links to Low End Mac and other Mac resources and explained the ins and outs of the B&W G3. I'm just glad the computer went to a good home - a switcher to the Macintosh platform no less. The darndest thing happened during the last few weeks. Oddly enough, the Power Mac 7600 started operating normally again. Almost as if the CD-ROM never stopped working in the first place, the Power Mac 7600 has been the focal point for a new flurry of Old World Mac activity. Currently I have two versions of the Mac OS installed, Mac OS 8.1 for a boot loader on one drive and Mac OS 9.1 on a second drive - and Yellow Dog Linux 2.1 on the same drive, but on a different partition from the Mac OS 8.1 boot loader. I'm not running any specific software; the 7600 is more a test bed for various applications and operating systems. The only measure I took to rectify the CD-ROM issue was to remove the old drive and attempt to install a replacement. Unfortunately, this replacement drive didn't have the same audio cable connector. A pull from a Mac SCSI external case, I was not sure the drive was bootable, but I was willing to try. It turns out I had no need to push this new troubleshooting issue further, because the old CD-ROM drive has worked fine since I put it back in its rightful home inside the lower right drive bay. Weird. 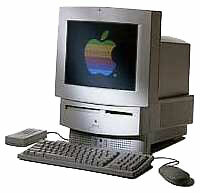 The 7600 and I spent many fun hours installing and testing a variety of older non-Apple operating systems. Very fun indeed. My LC 580 isn't currently configured for real work, but it's happily humming right along in the role of 68k Mac jukebox. Running Mac OS 8.1 with Apple Video Player and MpegDec, my most often used applications. The PowerBook 520c is still configured to be my secondary email, text Web browsing, and basic text editing system. A dual booting setup with System 7.5.5 and Mac OS 8.1, it's running SweetMail, WannaBe, Nisus Compact, NotePad Deluxe, and a VNC viewer. Nice to grab for those times calling for a little mobile work away from the desk. Both LC IIs are awaiting some much needed attention so I can finish doing some tests with my AppleTalk configured collaborative work environment. It's not a pressing need, but a fun project I want to finish toying with before AppleTalk is completely forgotten. Both LC IIs are positively begging for a processor upgrade. With only the single LC PDS slot, I surely don't want to lose ethernet connectivity, so I'm hunting for one or two reasonably priced, second hand Sonnet Presto Plus upgrades. These little devils are scarce. Sheesh, why are all the little gadgets I desire so hard to find (I mean used, so the prices are reasonable for my low income budget). Currently, I'm willing to trade the Power Mac 7600 (G3 upgraded and nearly 500 MB RAM) and have listed as much on the LEM Swap list. If anyone is interested in trading, selling, or has reference to a good deal on one or two Sonnet Presto Plus cards, please email me the information. Again, my email link is near the top of the page. Thanks. First, I need to expend some words gushing about how much I positively adore the 1400c. I'm of the mind to consider the PowerBook 1400c as one of my favorite Macintosh models, either portable or desktop, and there are many virtues to extoll regarding my love affair with this PowerBook. In fact, I have an entire article almost finished on my latest adventures with the PowerBook 1400c and setting up a viable networking solution. Clearly I'm not alone in my affection for the PowerBook 1400c. Several Low End Mac contributors are also quite fond of the 1400 and have written as much in the last several months. Specifics will have to wait until my next article, but I wanted to let a couple things be known: Yes, I did list the PowerBook 1400c for trade on the LEM Swap list. My reasons will become clear with the upcoming article, but suffice it to say, consider the 1400c off the market. The particular issue I had with networking has been solved, and although the item I desired in trade, a Sonnet Presto Plus processor upgrade (not just a processor upgrade, but also a RAM bump and ethernet card) is still much sought after by yours truly. However, I no longer feel the need to offer my very nicely kept PowerBook 1400c for trade. I'm sorry to leave the audience hanging without more details, but I have more than enough written for the next Embracing Obsolescence article. For now, I think I can safely say that no matter if 680x0, PowerPC, Old World, New World, Intel, or some yet unnamed future platform or processor technology, a Mac is still a Mac. I know all my systems have their good and bad characteristics, but half the fun for me is tweaking each system until I unlock their full potential. During these rewarding expeditions, I am safe in my knowledge a Mac is designed to work with me and not against me. Every computer platform strives for this goal, but clearly some have succeeded better than others.